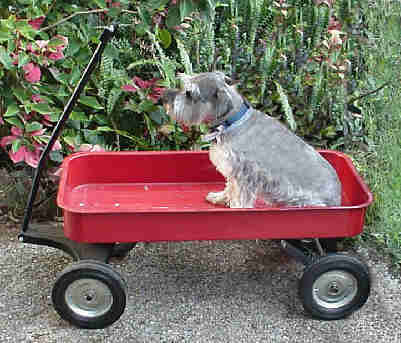 Popular Song: "That's Your Red Wagon"
Be the laughing stock all over town. That's your red wagon, your red wagon. So you just keep draggin' your red wagon along. The comments of Italo [not his real name] are in italics. The links I added later to help readers to locate more information about the ideas presented in the story. The terms PANACEA! [tm] , Matherne Optimal Speed Trace[tm] , and MOST[tm] are Trademarks of Scientific Specialists. It is important to note that the "15 SECONDS" recommended during the speed trace described herein is NOT necessary to do a successful trace. Simply moving from one time mark to the next as quickly as possible is sufficient. For beginners, however, using this exact method with the 15 seconds may be useful. Click at right to link directly to the Follow up to The Red Wagon Story. To Keep Up-to-date on Latest Changes, Subscribe to our Monthly Digest now. Not sure you want to subscribe without reading it first? No problem -- we've accommodated you by placing a recent Digest on-line. Click Here. >I just finished to read PANACEA! the book and the other material and I must say that I have learned a lot, but I am not able to specify, because of my ignorance, how much of what I read (besides the PC methodology used in the PANACEA! software) is new for the literature in the relevant fields of human behaviour, or not. If you receive this, it is because Doyle Henderson has allowed me, Bobby Matherne, to respond to your E-mail. I have worked with Doyle for several years now and am qualified to answer your questions as indicated by my position of Chief Researcher for Scientific Specialists. So much of the theory that Doyle has come up with is new that it provides the basis for a new science of the acquisition and transmission of emotional traits, just as genetics may be described as the science of the acquisition and transmission of physical traits. If you had asked Gregor Mendel in 1880 a similar question about his work on genetics [the name had not been applied yet]: "How much of what I read is new for the literature in the relevant fields of human life?" What do you suppose he would have answered? "All of it is new, because no one had ever pinpointed the single unit of the carrier of acquired physical traits!" is a possible answer by Mendel. Similarly, one could say today: "All of it is new, because no one had ever pinpointed the single unit of the carrier of acquired emotional traits!" To the extent that doctors and therapists of all kinds have had successes with their patients, they have used some process that this new science [I have named it"doyletics" after its originator.] explains in full. But because they lacked a full understanding, what worked for one of their patients did not work for the next one. In other words, the practitioners out there today who have no knowledge of doyletics are as successful in their practice as folks were with doing work in raising hybrid plants before Gregor Mendel did the basic experimental work that created the field of genetics. What Doyle Henderson did, was to put the pieces in place for a comprehensive theory of emotions that is unknown in the literature, up until now. All this being said, there is much work remaining tobe done, and that work is of no small consequence. This theory and its implementation will provide relief for every human being from unwanted emotions, but the specific method of relief is difficult to explain how to use because there is no basic understanding of the theory on which the application PANACEA! is based, up until now. In spite of that, Doyle has clients all over the world who are using it successfully to solve problems that their personal caregivers had long given up on. 1.) No doubt that the great majority of people feel the same way in certain situations, so there must be a common denominator of environmental conditions during early childhood similar to all. The exceptions confirm the rule. These similar feelings or emotions must be considered normal for our Western society. Therefore and for instance, what is the cause common to all that makes all of us feel grief for a person dear to us who has "left" us? Can you describe which types of events during childhood have caused that body-states, or combination, which is being recreated in the grief occasion? One of the biggest stumbling blocks to understanding doyletics is that there is NO bigger falsehood that one can make, even though it is commonly accepted as Gospel truth: "No doubt that the great majority of people feel the same way in certain situations". It sounds true and is accepted as truth, but it is completely false. Let me explain by means of a simple story. Suppose in a small town, all the young boys have the habit of pulling a wagon behind them and picking up various items that they find lying around in the streets, garbage cans, empty lots, etc. Then after a week of doing this, some scientist comes to town and inventories the contents of the various red wagons. What would he find? He would find an enormous similarity of the items in each of the red wagons, would he not? But would he make the enormous leap to generalizing that the contents of every red wagon is identical? I think not. Well, each person from 3 months in the womb of his mother has a little red wagon in which doyles are collected. "Doyles" is my word for physical body state -- some configuration of muscle tension or motion of muscles, limbs, or organs of the body. These doyles are stored in the brain structure known as the amygdala [as best we can understand it at present -- see my review of The Emotional Brain by Joseph LeDoux]. When some future event provides a stimlus that is similar to the original event's stimulus, the original doyle is triggered and the person's body goes into the physical body state of the original event. The amygdala has a primitive pattern recognition capability that recognizes the stimulus and releases the signals to re-trigger the associated doyle. The amygdala is like the red wagon. Everyone has one, and all the collected doyles are stored in it. Just like in the red wagon story, if you examined the contents of each red wagon, you'd find similar contents, but also drastic differences. Some kid's father is a druggist and his little red wagon has a lot of pill bottles, for example. So, when you say, "there must be a common denominator of environmental conditions during early childhood similar to all", you are stating a truth that is statistically accurate [most kids wander through the same portions of the small town, and so collect similar items], but there can and will be DRAMATIC differences in the contents of their red wagons, like the druggist's son with all the pill bottles. So now, even though there is some truth to the statement that "No doubt that the great majority of people feel the same way in certain situations", you maybe understand why some people will have dramatically difference responses to the same stimulus, such as looking a dam with big pipes near water. For most people it's just an interesting scene, but for you it causes great fear, up until now. Regardless of what items are available on the street of the small town, what is in the wagon of one small boy can be dramatically different from ALL the other small boys. Suppose one boy has a red wagon, but walks through town, and instead of picking up items and putting them into his red wagon, he picks them up, analyses them, remembers them, and places them back on the ground. He will return home and when the scientist comes to investigate the contents of his red wagon will find it EMPTY or nearly so. This corresponds exactly to what happens in severe cases of autism. Due to precocious onset of conceptual memory an autistic child will store events in their conceptual memory that other children of the same age are storing in their doylic memory. The result is they will not be able to speak [or barely so] -- smooth speaking requires doylic storage, they will have no feelings or emotions [or only very strong anger, etc], and so on. Their red wagons are nearly empty of the usual items even though they wandered the same streets and learned just as much as their peers about their environment. Because of their advanced conceptual memory capability they are unable to ever experience any feelings, emotions, or create tonal variations in their speech, because they never stored that doyle in their red wagon before they reached five years old. Why five years old? This is an experiential finding as a result of Doyle Henderson's over twenty years of research with human beings. If, in doing a trace with a person, they go backwards in time to before five years old, the physical body state is removed [actually changed into a conceptual memory]. If, in doing a trace with a person, they do NOT go backwards in time to before five years old, the physical body state is not removed and is available for re-triggering given the presence of an appropriate stimulus. Okay, I agree, this doesn't exactly explain "why" because we wish a theoretical explanation for why. Here's mine. The human brain is too big to come through the birth canal at full size, therefore we are born today about three years before the brain reaches full size. The mass of the brain doubles after birth. The skull plates are like tectonic plates that slide open until the brain reaches full size and only then do they knit together at the top. Until then there is a perceptible "soft spot" in the child's skull. Once the brain reaches full size, the possibility for conceptual memory begins, but it requires training to be effective. That training takes about two years, during which two year period, more and more events are stored as conceptual memory and less and less as doyles, until about age five, no more are ever again stored as doyles. 2.) In Chapter 16, pag. 16-11 in the last three paragraphs you mention "...skilled counseling...therapist...". Does that mean that it is only a question of selecting a good therapist to do the job of PANACEA!? How would you then differentiate PANACEA! from psychoanalysis? Should you give a short report to a psychoanalyst and to a psychiatrist about PANACEA! to show the differences between these two disciplines and PANACEA!, how would you state them in summary and in points (1..., 2...., 3..., etc.)? I would appreciate very much your responding to this point in a way that I can later use with some friends psychoanalysts and psychiatrists I intend to visit after I have experimented the tracing process on my person. My suggestion is to save yourself the time and effort. Neither disciplines you mention will credit some un-heard of science as being the basis of their life's work. Their partial answer is enough for them and you'll find, as Doyle has on umpteen occasions, that their ears will be closed to your efforts and they will try to cure you of what they regard as your new found compulsion. 3.) I would like to assess the usability of PANACEA! therefore, say, out of 100 people who have used PANACEA! how many of them have been successful in their tracing process? I would like to say that when one understands the red wagon story and does a Matherne Optimal Speed Trace [tm], that 90% of the people will get it the first time, and the other 10% will need some hand-holding and re-direction. Doyle can better testify to the numbers for PANACEA!. For myself and the people I've worked with, we've successfully eliminated every doyle that we traced. This is true for the sustained doyles; the ones that are ephemeral [transitory] are more difficult and require several attempts, but even those are amenable to elimination. I'm in the womb, 1 month before my birth and I'm holding this item. I'm in the womb, 2 months before my birth and I'm holding this item. I'm in the womb, 3 months before my birth and I'm holding this item. I'm in the womb, 4 months before my birth and I'm holding this item. I'm in the womb, 5 months before my birth and I'm holding this item. I'm in the womb, 6 months before my birth and I'm holding this item. I'm in the womb, 7 months before my birth and I'm holding this item. That's the complete Matherne Optimal Speed Trace [tm], what Doyle calls the MOST[tm] for short. You don't need to continue the trace any longer once you go to a time mark and the item you're holding disappears. If you're not sure it's completely gone, do another time mark or so to make sure. The only important rule is to go below five years old or else the doyle will return again, probably in some other context of your life, which means you'll get another chance to trace it. What is it you're holding in your hand? This is a metaphor for indicating that some physical body state is currently active in your body. If the state is ephemeral and slides away after a second or so, you will need to re-trigger it, by imagining looking the dam/water/pipes again, for example, before proceeding to the next time mark. Notice: it is NOT necessary to remember anything about your childhood! ! ! It is in fact impossible for most people to do that anyway for ages much below five-years-old. All you need to do is hold some doyle that you have collected in your Red Wagon before five-years-old [which doyletics theory postulates are the only ones that exist] as you go through each time mark. Rightly understood, doylic memories are pre-stored physical body states, and cognitive memories are what everyone calls just memories. During a speed trace, you wander down memory lane till you find where you originally picked up the doyle that you put in your red wagon, you remove it from the red wagon, look at it carefully, and you place it back on the ground where you first found it, remembering for the first time cognitively what you had been recapitulating doylicly since that early age before five years old. When next that doylic event would have otherwise been triggered, you will only recall the original event or the time when you traced it and you will remember it only cognitively. 4.) I am wondering why a methodology such as PANACEA! has deserved only few minutes of a radio program, no matter how much important, and has not deserved so far a TV program, such as a talk-show, given the greed or avidity of TV programmers especially in your country for novelties in general and in particular in the fascinating field of mankind behavior, which usually attract great audiences. Gregor Mendel's papers laid forgotten away for over twenty years before someone discovered them and the public was finally ready for them. Most inventions that are truly unique go through a similar period of gestation. The best audience for this work is individuals like yourself, who take the challenge and prove its effectiveness in your own life. We are yet in the research stage of this new science. Remember what the pre-mature disclosure of cold fusion did: lots of public attention followed by public dissatisfaction because no magic results were forthcoming. Better to have individuals learning to use this one at a time successfully than to have millions failing miserably at some promised miracle cure and turning off to even hearing about it ever again. Click at right to link directly to the Follow up to The Red Wagon Story if you wish to read more about the relationship between emotions and doyles, among other things.